Have your cake and eat it too – with these simple tricks for staying healthy during the crazy holiday season. The holidays can be a daunting time for healthy eaters. Between the pecan pie, the stuffing, the gravy (oh my, the gravy! ), there seems to be temptation everywhere we turn. Some folks choose to avoid the pitfalls of holiday gatherings with a strict set of rules: No dessert, no alcohol, no bread; they may even skip some events for fear of temptation. Where’s the fun in that? The holidays are all about spending time with friends and family, not staying home and munching on celery sticks! Turns out, with smart choices and simple strategies, you can attend holiday get-togethers to your heart’s content (and eat dessert too!). With our list of holiday tips, eating healthy during this festive season will be a breeze. Here’s how to enjoy the season to its fullest, with minimum guilt. Follow Your Heart: Choose foods that you truly love. You don’t have to try everything at the holiday buffet; use your calories wisely, and only go for the foods that you really enjoy. Don’t fill up on foods just because they’re seasonal or “traditional.” I mean, do you really even like eggnog? A cup of the iconic stuff packs over 200 calories, and a whopping 35% of your daily saturated fat intake. “Take 10:” Ready for that second plate? Not so fast. It takes a few minutes for the “I’m full” signal to reach your brain, so one of the best holiday eating tips is to go slow, really savor what you’re eating, and wait 10 minutes before heading back to the buffet for round two. Chat with a friend, drink some water, then re-evaluate your hunger. Burn it Off: As if the calorie-laden feasting wasn’t bad enough, we tend to sit around a lot during the holidays – chatting with family or watching football and parades. Sign up for a “Turkey Trot” or similar fun run, because staying active is one of the best healthy holiday tips out there! It’s Not the End of the World: You know you can make pumpkin pie in March, right? Even though some foods may traditionally be assigned to certain seasons, you can really eat anything at any given time of year. So instead of feeling that “last chance” panic and overloading on every special food option, promise to make green bean casserole in June, and get your Grandma’s butter cookie recipe to enjoy later, too. Keep Your Healthy Habits: We know the holiday season can be busy, but it’s more important than ever to maintain your healthy lifestyle. When it comes to healthy holiday tips, our biggest piece of advice has nothing to do with diet. Simply getting enough sleep, drinking plenty of water, keeping your exercise schedule, and not snacking between meals will work wonders for making it through the stressful season! And while a lot of attention is placed on holiday weight gain, it turns out that the situation isn’t as dire as it seems. According to The New England Journal of Medicine, the average person gains a mere pound over the holiday season. The bad news is, we typically don’t lose that extra pound, so they add up year after year. And, for people who are already overweight, holiday weight gain averages 5 pounds each year. 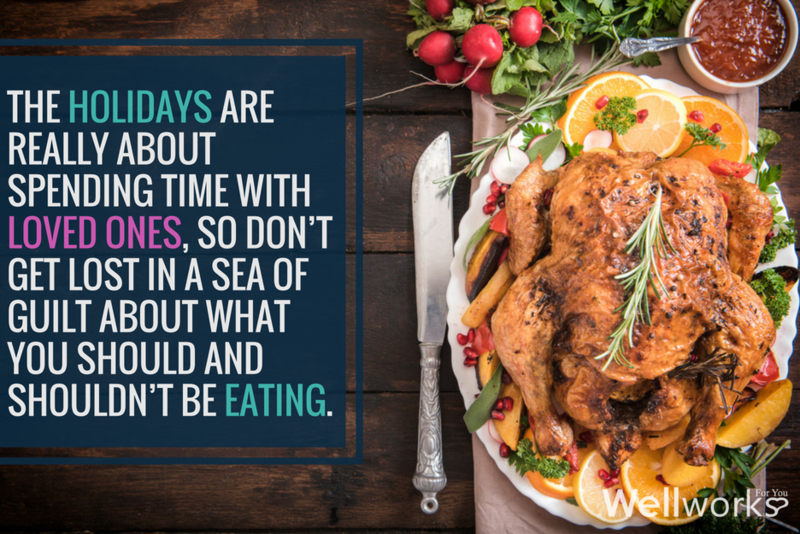 When it comes down to it, the holidays are really about spending time with loved ones, so don’t get lost in a sea of guilt about what you should and shouldn’t be eating. Put the focus on enjoying your friends and family, and forgive yourself for minor indulgences. After all, “eating well” during holidays certainly includes a slice of pie! For more information on healthy eating during holidays, give us a call today!